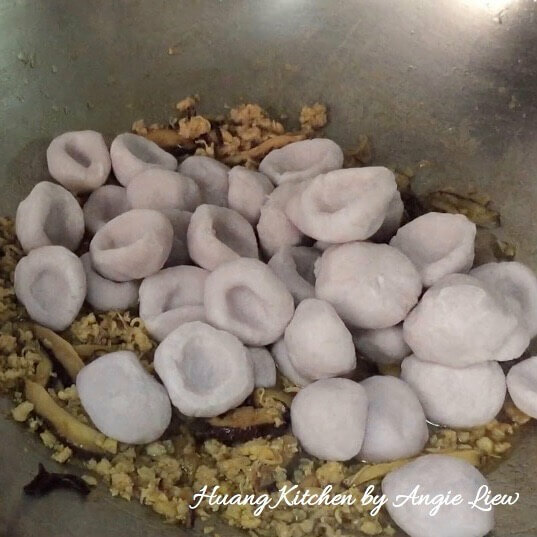 Yam abacus seeds (算盘子 Suan Pan Zi) or yam gnocchi is an auspicious dish that is popularly served during the lunar new year as the ROUND yam abacus represent reunion and signifies wealth and prosperity. It is called abacus seeds as it looked like the seeds in an abacus. And it carries a very symbolic meaning, MONEY is in abundance! Abacus seeds are made from yam paste and tapioca flour. When cooked, these yam abacus seeds are soft on the outside, chewy on the inside and full of strong yam aroma. 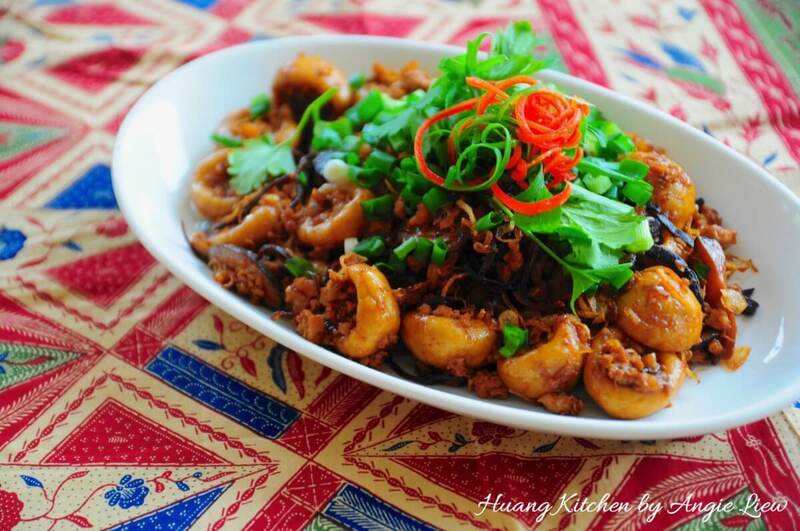 It is a savoury dish that can be served as a main meal or even on its own, as a snack. 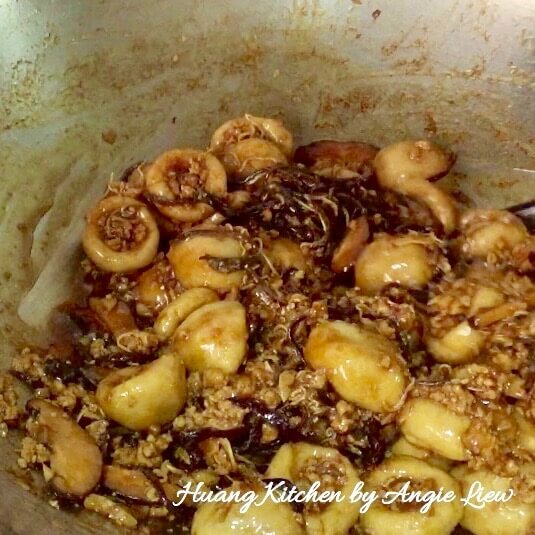 Certainly a most welcome dish for the coming Chinese New Year reunion dinner. 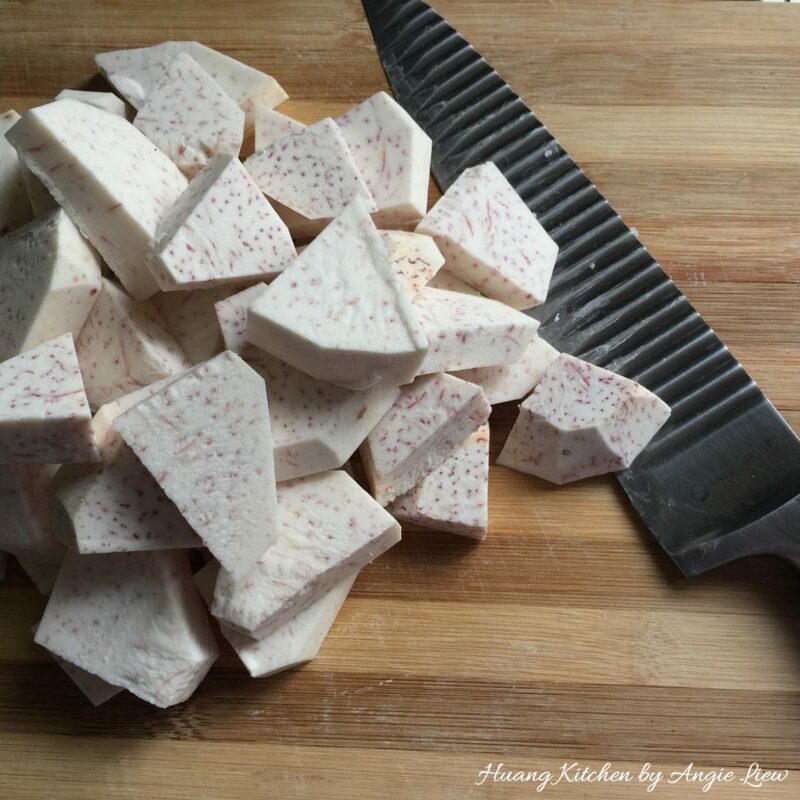 Last but not least, to all taro fans, you will surely find these an absolute delight especially in the way they’re cooked and served. 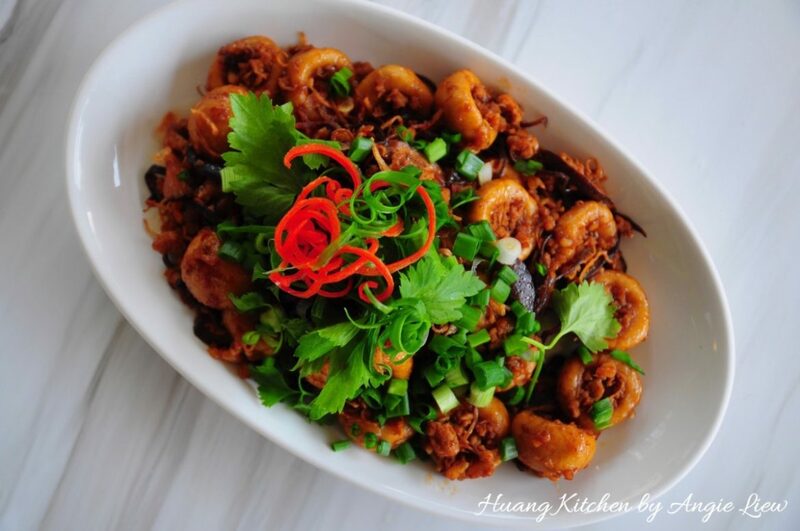 Abacus Seeds, also known as Suan Pan Zi 算盘子 is a traditional Hakka dish. This auspicious dish is popularly cooked during festive occasions as the abacus seeds signify wealth and reunion. 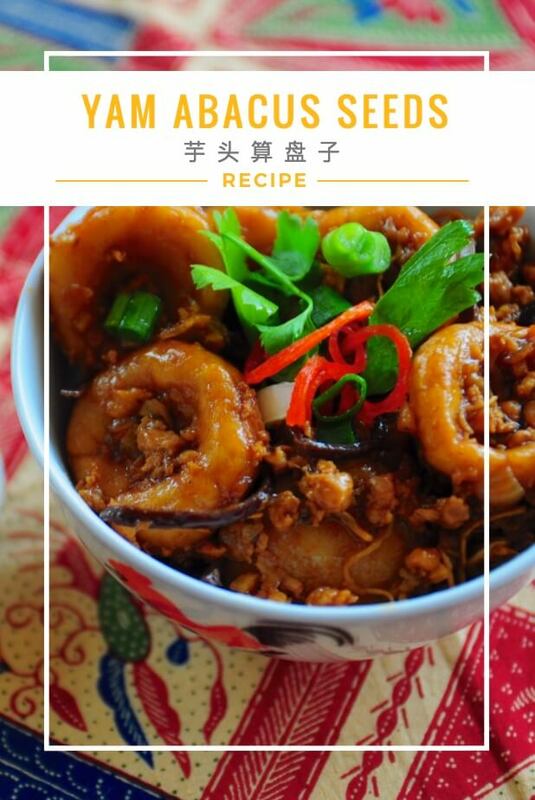 Made with yam and stir fried to perfection! First peel yam and cut into thick slices. Steam yam for 30 minutes, till very soft and cooked. 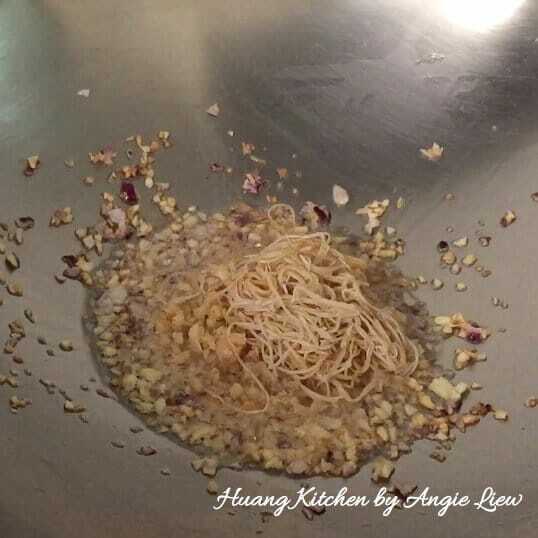 If using a wok to steam, bring water to a boil before putting in to steam. 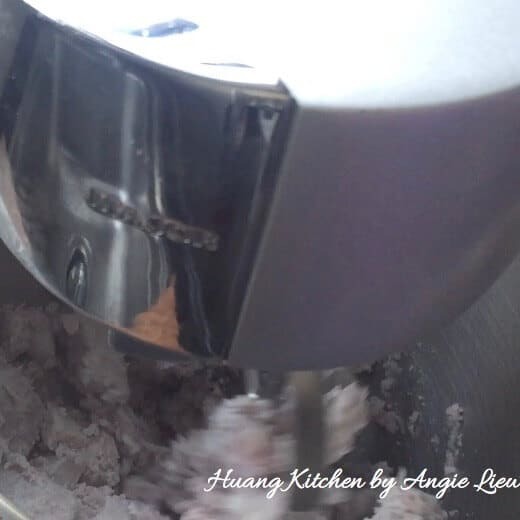 Quickly transfer cooked yam to a stand mixer (use the K attachment). 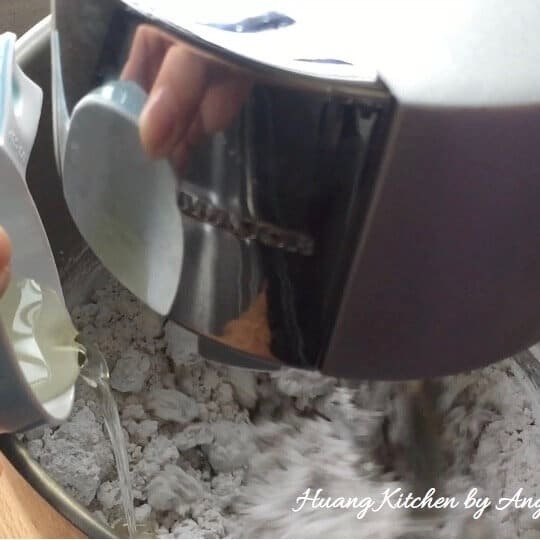 Using the lowest speed, mix until the yam is thoroughly mashed. Then add in tapioca flour and salt. Continue to mix. Next, add in vegetable oil. Lastly, slowly add in boiling water, a little at a time and mix till the dough comes together. 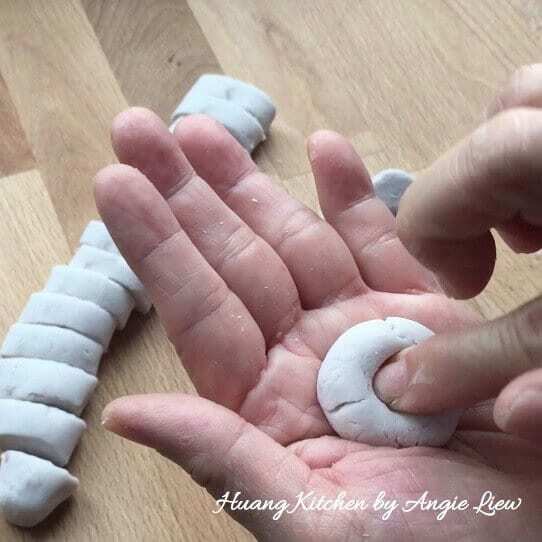 Then, change to the dough hook attachment. Mix for another 10 minutes on the lowest speed, or until you get a pliable dough. 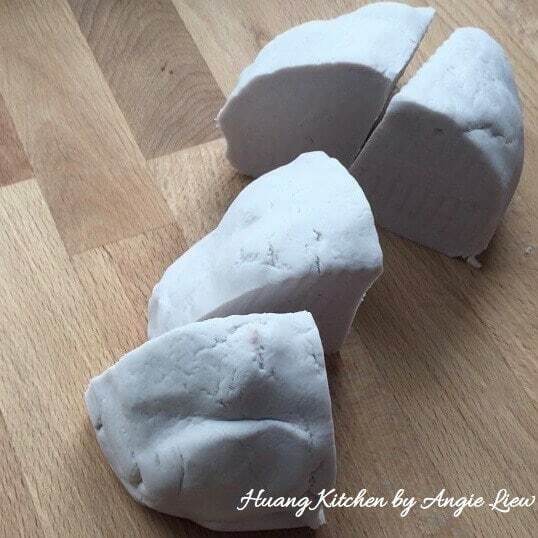 Alternatively, you can also mash the steamed yam by hand and hand knead into a dough. When done, divide the dough into smaller pieces. Roll into long logs and cut into small even pieces, about 5g each (or your desired size). 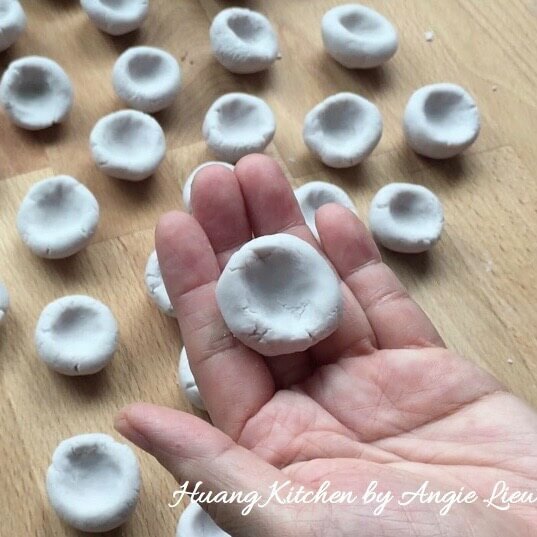 Roll each piece in between your palms to form round balls. Use your index finger to press in the centre of the ball (make a slight depression), forming an abacus seed shape. Continue to do the same with remaining dough pieces. Note that making same-sized abacus seeds will ensure even cooking. Boil a large pot of water. Add in yam abacus seeds in batches, stirring well to prevent them from sticking together. 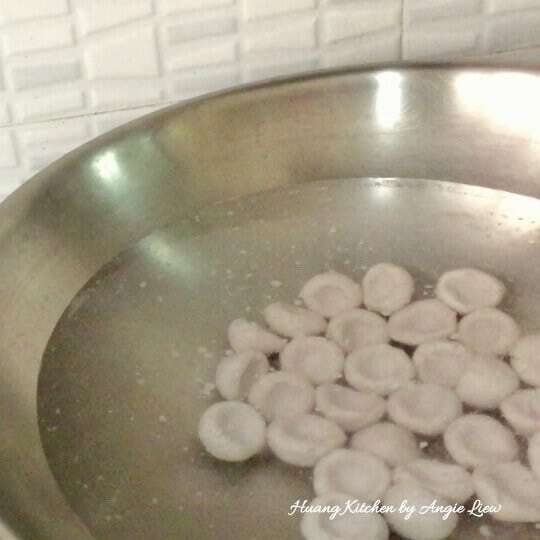 Boil for about 15 minutes or until abacus seeds float up to the water surface. 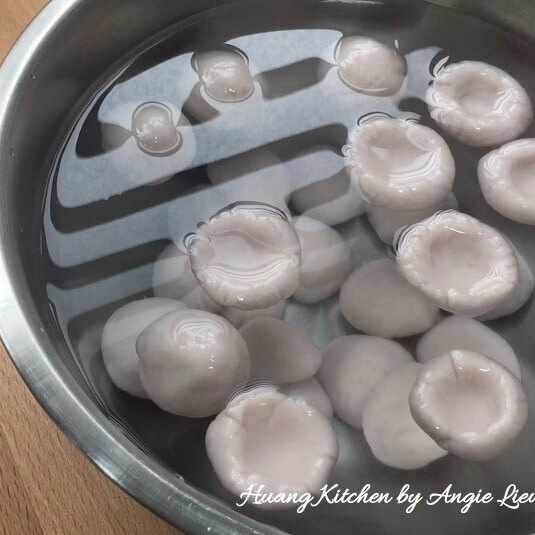 Remove from boiling water and immediately rinse in cold water for about 5 seconds. This 'shocking' technique halts the cooking process and firms up the abacus seeds. 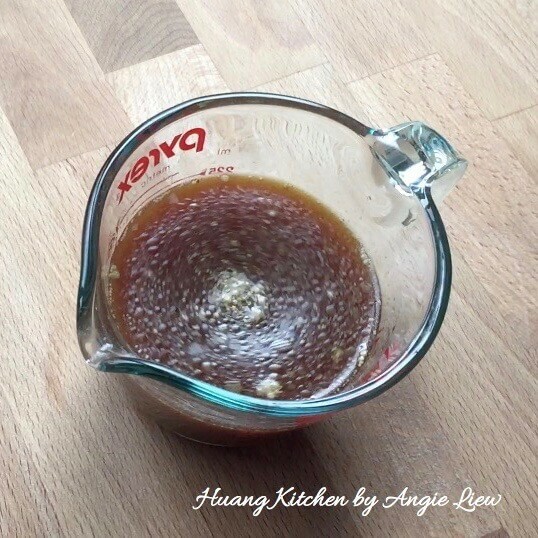 Drain water and drizzle cooking oil. Coating the abacus seeds evenly with oil prevents them from sticking together. And we're ready to fry the yam abacus seeds! First soak, then chop dried shrimps. 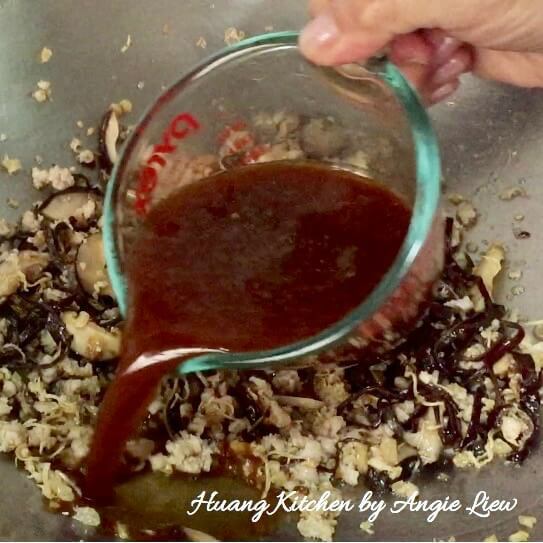 Cut dried shiitake mushrooms, black fungus and dried cuttlefish into strips. Mince the meat, then chop garlic and shallots. Mix all seasoning ingredients together. And we're ready to stir fry the yam abacus. 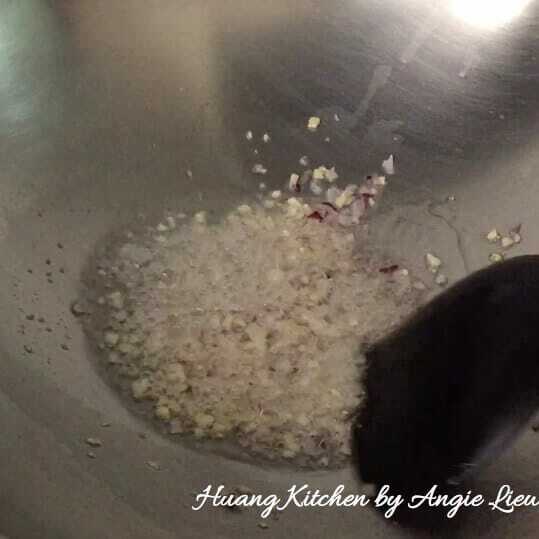 Heat up oil in wok and saute chopped garlic and shallots till aromatic. Then add in chopped dried shrimps and cuttlefish strips. 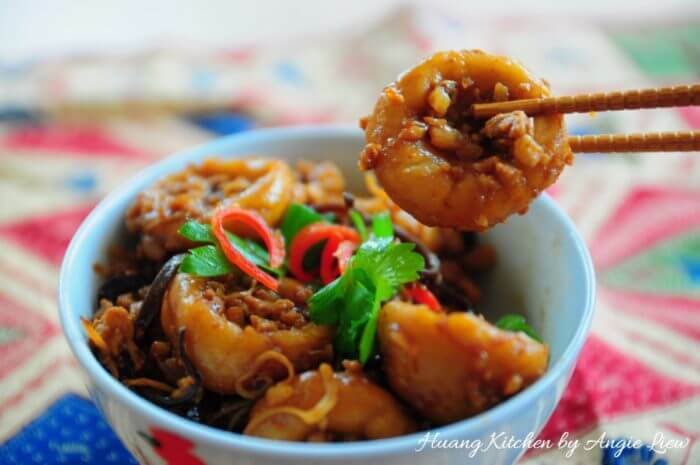 Stir fry till dried shrimps turns golden brown and fragrant. 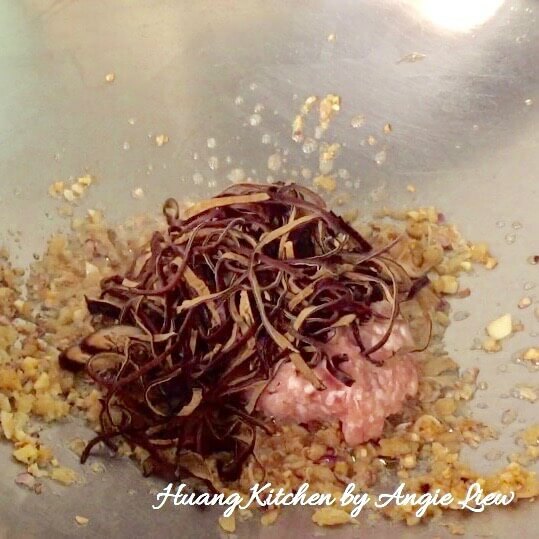 Next, add in mince meat, sliced shiitake mushrooms and black fungus. Continue to fry and mix everything together. Add seasonings and bring to a boil. Next, add in the cooked yam abacus seeds. Stir fry until sauce dries up. And we're done! 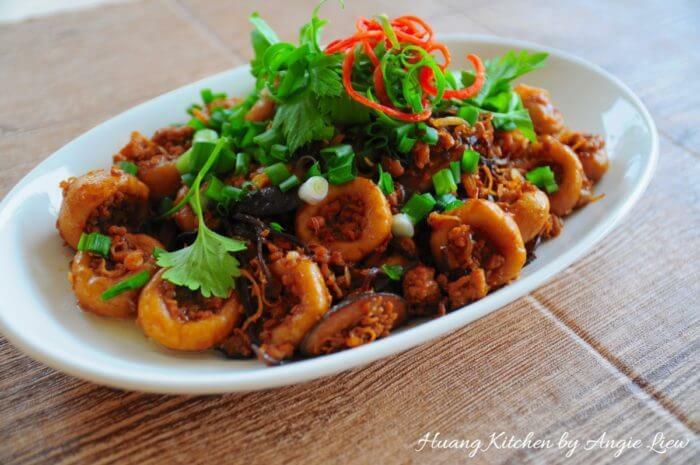 Garnish with crispy fried shallots, spring onions, chinese coriander and red chilli strips. As always, Enjoy! For abacus seeds with more yam flavour, recommended ratio of yam and tapioca flour is 3:1 (i.e. 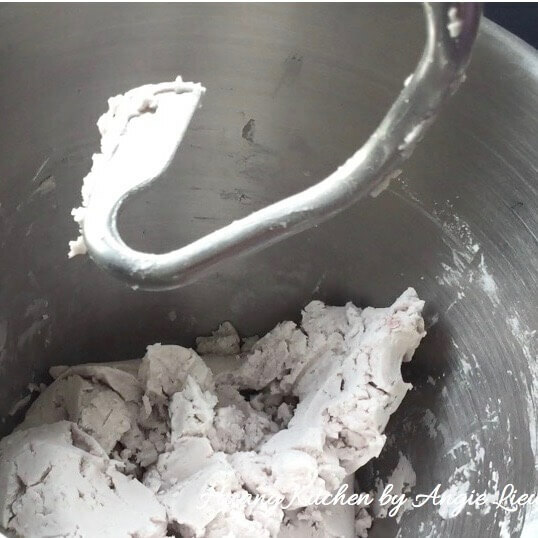 3 parts of yam to 1 part of flour). 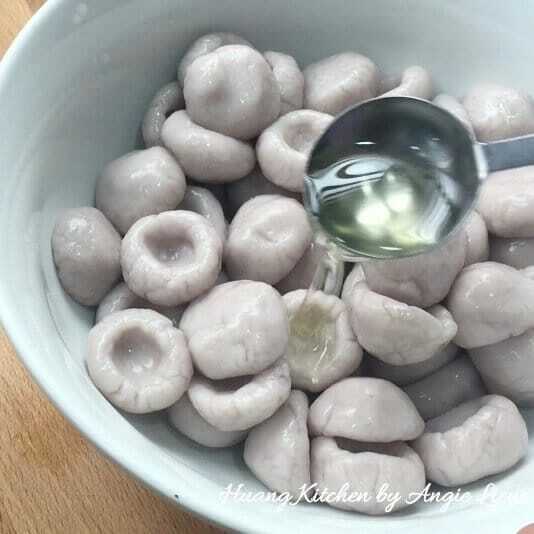 If more QQ and chewy yam abacus seeds are preferred, add a little bit more tapioca flour. 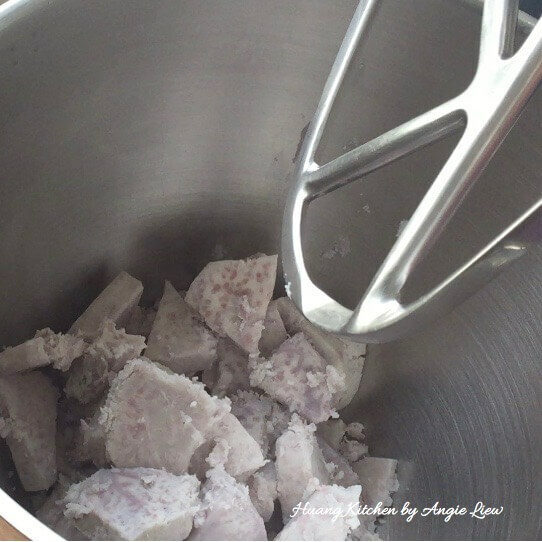 When making yam abacus dough, sometimes you may need to adjust the amount of water and flour used as texture of yam may be different. So do adjust accordingly. Making yam abacus seeds in the same size will ensure that they will be evenly cooked. 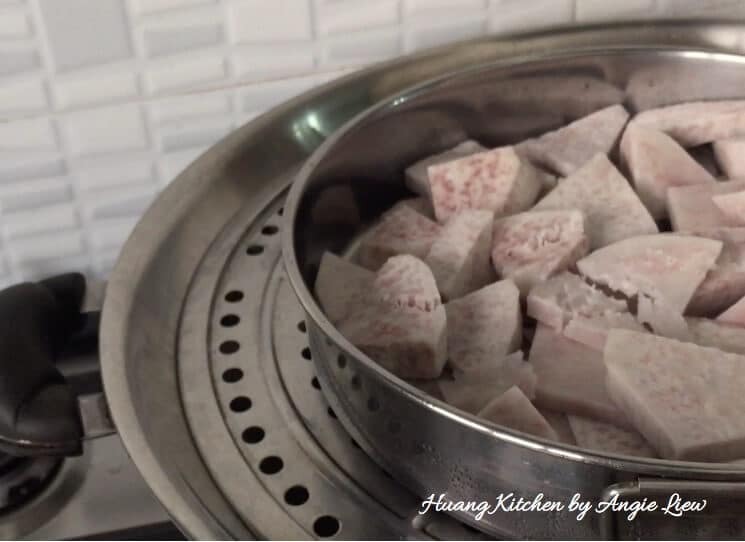 Cooked yam abacus can be kept frozen in ziplock bags for later use.